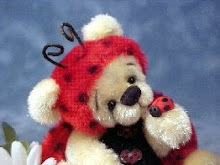 Love Bears All Things---thislittlebear.com: Bright Star spring show!! Regardless.......I've got several new teddies ready for adoption so follow this link to get to the show which runs May 12-14th! They won't allow us to give too much away but there are so gorgeous bears available so make sure you stop by and pick one out to add to your hug! Click here to visit the show! !